and the towering 10ft-plus. Cad-Re trees are Noble Firs because of their beauty and long-lasting freshness. Store the tree in a cool, but not freezing spot until needed. (Frozen trees will lose needles quicker.) Slice off the base to expose fresh wood; stand the tree immediately in water, with nutrients added. Keep the tree in fresh water always. 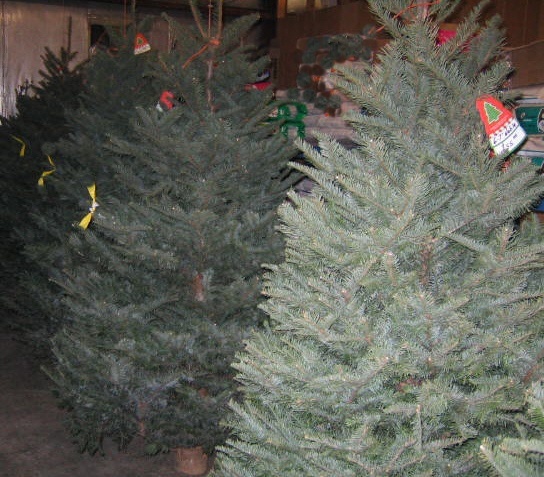 Buying a Christmas Tree is a very personal decision, everyone has a unique vision of the perfect tree. The thick trunk is a unique Noble feature. NOBLE FIR (Abies procera) The most regal and breathtakingly beautiful tree available. Its silvery-blue-green needles and naturally layered growth habit are what make the Noble Fir the clear King of Christmas Trees. Because the Noble Fir is native to the Pacific Northwest the growing conditions are just right to produce full, healthy, fresh trees with long-lasting needle retention and superb fragrance. 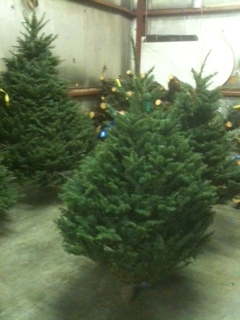 Nobel Fir Trees on display in the Cad-Re Feeds warehouse. DOUGLAS FIR (Pseudotsuga menziesii) A famous Washington State native species and the reason Washington is dubbed "The Evergreen State", this lovely tree has long been the staple of Christmas Tree Sales. Whether you choose naturally layered allowing more space for ornaments or sheared for fullness, the Douglas Fir is a true classic. GRAND FIR (Abies grandis) The richly deep green needles of the Grand Fir have a unique textural appeal not found in any other Christmas Tree. Their fragrant scent and outstanding color are the reason they are such a holiday favorite. Grand Fir come in two styles, either medium sheared for a more natural layering, or more heavily sheared for thick fullness. FRASIER FIR (Abies fraseri) The dark blue-green color of the Fraser fir contrasted with the silvery-white band on the lower surface of its needles makes this tree a unique crowd pleaser. It has a pleasant scent and majestic form combined with long-lasting needle retention and excellent shipping qualities. SHASTA FIR (Abies magnifica var. shastensis) The magnificent coloring of the Shasta Fir presents a mix of silvery-blue-green. With its naturally layered growth habit, outstanding fragrance, and appealing lighter coloring, the Shasta is a pleasant surprise and welcome alternative from more traditional Christmas Tree species for many. Alpine Farms in Port Orchard, Washington Bear Canyon Tree FarmCinebar, Wa.